Instantly add a sporty, fun look to any outfit by simply slipping this on. Light quilting with adjustable snap belts on each side make it easy to avoid a bulky look. Two front zip pockets and a full front zipper add to the easy style and utility. Wear it over long sleeves on cool fall days, or under a jacket for an extra layer of warmth when it's downright chilly! This vest is very versatile and very fashionable! NOTE: This vest does run small - order next size up. Light quilting with adjustable snap belts on each side make it easy to avoid a bulky look. Two front zip pockets and a full front zipper add to the easy style. The design of this vest gives the illusion of longer legs with the pointed shape of the hemline. 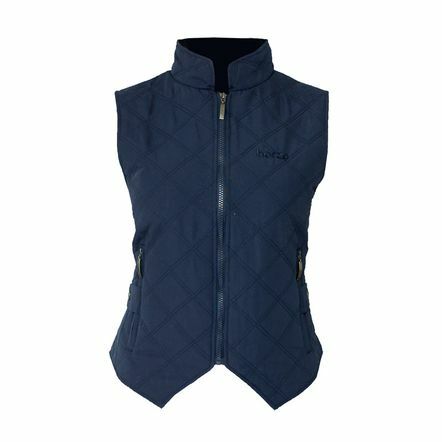 An embroidered Horze logo adorns the upper front in a matching color tone. This vest is very versatile and very fashionable! 100% polyester with thin padding. Back length for sizes 6/8-36/38: 23.6 in (60 cm).